The Red War was a system-wide war fought in the Solar System, between the Guardians of the Last City, Cabal Red Legion, and other races of the Solar System. After years of fighting against the proxy forces of the Darkness and emerging victorious, the Guardians found themselves outmatched when the Red Legion launched a surprise attack on the Last City itself, destroying the Tower and sealing away the Traveler's Light. With their powers and arsenals lost and their home destroyed, the Guardians retreated to the European Dead Zone to recover and plan a counterattack in order to save their home and legacy from Ghaul. "On my order, the Dead Orbit fleet is well clear of Saturn. We'll need them to defend the City, if it comes to that. They've picked up a high-gain signal from the Cabal beachhead on the Dreadnaught. The message is outward bound. Its target is far outside the solar system. We have to know what they're saying and who they're saying it to." During the Taken War, the Skyburners established a beachhead by ramming into the hull of the Dreadnaught. Their primary objectives were to assume full control of the Hive Dreadnaught and find a way to relinquish a Guardian of its Light, of which the Hive are infamously known for. Unfortunately for the Cabal, the Taken and Hive decimated their forces, while the Guardians compounded their losses by taking out any remaining commanding officers the Cabal had stationed. In light of the catastrophic losses to both the Guardians of the Last City and Oryx, the Taken King, the remaining Cabal forces transmitted a detailed distress signal directed to the incumbent head of the Cabal Empire, Dominus Ghaul, to inform him of their casualties and findings. Although the transmission was intercepted by the Guardians, it was nonetheless received by the Cabal Empire. The Cabal ultimately answered, leading to the beginning of the Red War between the Red Legion and the Last City. The Red Legion engages the Tower. "How do we come back from this?" Although the Psion Operatives of the Legion have managed to compromise the sensors, defenses, outposts and suppressed the Satellite's communication systems of the City and Reef. 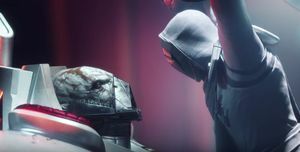 In anticipation of the coming attack, one of the Nine, highly implied to be Mercury, directly sought to use Ghaul's efforts to understand how to manipulate the Light to forge a body for themselves. To achieve this, they even managed to blind the Guardian's precognition and prophetic abilities in order to enable Ghaul's coming surprise attack to be 100% effective. On the anniversary of the Battle of Six Fronts, the Vanguard discovered that all of their outer defenses, satellites and outposts went dark and in the cover of a storm, the Cabal Red Legion approached the outer territories of the Last City unnoticed. 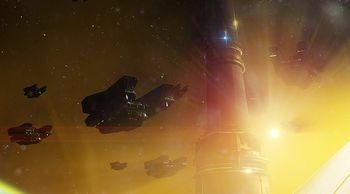 At the time, the Vanguard were having a meeting, when Zavala quickly noticed the approaching warships, forming a Defender bubble to defend the Vanguard. In one swift attack, the Red Legion severely devastated the Tower, but the Vanguard leadership survived and aided in the fight against the Red Legion troops. As the Legion's fleet assaulted the City, a mysterious massive aircraft latched onto the Traveler. During the chaos, the Speaker was swiftly captured by the Red Legion, leaving the City and its Guardians questioning his whereabouts. Despite this, civilians were successful in evacuating but the Vanguard was quickly overwhelmed. The Guardian, returning from a mission far outside the city, returns just as the Red Legion's attack overwhelms the City and joins the fight to defend their home from the Cabal invaders. "The City is secure. Those who fled, are being hunted, and those fools that remain have been executed." The Guardian attempted to disorganize the enemy by disabling the Cabal command ship and though they succeeded in infiltrating the ship and in destroying the Shield generators, no reinforcements could make it, and they were confronted by Dominus Ghaul himself. There the Cabal Emperor activated the Light-restraining device upon the Traveler, encasing it in a force field. This act cut the Guardians off from the Traveler's Light, effectively crippling them. Ghaul savagely beat the weakened Guardian, even sending them off of his command ship along with their Ghost, plummeting to the devastated city below. Two days later, barely surviving the fall, the Guardian and their damaged Ghost linked up with others, and with little choice, they evacuated the Last City. With the Legion firmly controlling the City, any of the Lightless Guardians who were unable to evacuate were hunted and executed on the spot. Despite Ghaul's success in attacking the City and the loss of the Light, the Guardian refused to give up the fight, and after setting up a camp in the European Dead Zone, they sought out to gain new powers and began developing a counterattack against the Red Legion. The Guardian would gain the aid of citizens who lived beyond the Last City's walls, led by Suraya Hawthorne, leading them and other survivors to The Farm. "I am Ghaul, and your Light... is mine." Dominus Ghaul interrogates The Speaker. As Ghaul began to occupy the Last City, he sent his forces across the system to ensure the Red Legion have full control over the system. The Dominus established a massive ship outside of the sun, The Almighty, which projected a beam of energy directly into it, slowly destabilizing the sun. With this, in the event the system continues to resist or when the Cabal are done with the system, The Almighty will cause the sun to go Supernova and destroy the System. Additionally on Nessus, Ghaul sent some his Red Legion forces in order to occupy the planetoid and begin drilling into the Vex ruins that lied there. The Red Legion's drilling operations awakened the Vex and Protheon, Modular Mind and their activities alerted the Fallen there, engaging them as well. Another Red Legion force was sent to the moon of Io, where they began to drill into the planet to access the latent Traveler energies within the moon, hoping to see if its possible to harvest and control the Light. However, their actions attracted the remnants of the Taken, catching the Cabal off-guard and a great many of them became Taken themselves. It was clear that a new mysterious entity has begun to direct the Taken in the absence of Oryx. "If we wait, we die. But if we attack together, we can take back our home, our Light... our hope. Or we die trying." Despite the loss of the City, the Vanguard sought to regroup what was left of their forces and launch a counterattack against the Red Legion to take back the Last City and free the Traveler. They planned to regroup on the moon of Titan but found that a new breed of Hive have already infested much of the planet, losing many Lightless Guardians in a failed attempt to drive the Hive off. This weakened Vanguard moral and their leadership splinters off into different areas of the system. The Guardian at the Farm, following visions from the Traveler after being defeated by Ghaul, traveled to a lost shard of the Traveler located in the most dangerous area of the Dead Zone. After fighting through soldiers of a new Fallen House, the House of Dusk, the Guardian was able to reach the shard and interact with it. Doing so, the Guardian was able to tap into the Light that remained in the shard and regained their abilities. With their powers restored, the Guardian traveled to Titan to aid Commander Zavala in establishing a new base to prepare a resistance against Ghaul. In addition, in gaining the equipment needed to decrypt vital Cabal transmissions, Zavala and the Guardian learn about The Almighty and its purpose. Despite Zavala's guilt in failing to protect the City and the danger of the Almighty's threat, his resolve and determination is restored thanks to the Guardian's efforts but to ensure their resistance is successful, Zavala needs his old fireteam: Cayde-6 and Ikora Rey. Tasking the Guardian to find them, they follow a lost transmission of Cayde's that leads them to Nessus. There, they receive the aid of a damaged Golden Age AI, Failsafe, and it gives them directions to find Cayde. Soon enough, they find that Cayde is trapped in a Vex time-loop after attempting to steal a Vex teleporter for the purpose of reaching Ghaul. After fighting the Vex and the Mind controlling the loop, the Guardian was able to free Cayde and convinces him to return to Zavala to form a resistance. Before departing, Cayde advises the Guardian to travel to Io, as he believes that Ikora would travel their to seek answers during trying times. Traveling to Io, the Guardian was quickly able to find Ikora but she is unsure if a resistance is possible due to the loss of her Light. During this, the Cabal Red Legion have succeeded in mining for the Traveler's energies within the moon. Investigating the Cabal base, they find it eerily quiet and are soon ambushed by the Taken which surprises Ikora and the Guardian at their return. Despite this, the Guardian was successful in preventing the Taken in corrupting the Light's energy and forming a bridge to their dimension. Ikora is quick to hypothesize that the Taken are following the direction of new hidden entity. To further understand the Almighty, the Guardian travels into a breached Warmind Vault to process the necessary data. Guided by Ikora and a recently awakened Asher Mir, the Guardian succeeded in entering the Vault after defeating the Vex and the Taken. Using the processing power within the Vault, Ikora and Asher learn that they cannot destroy the Almighty without destroying the sun in the process but they are able to permanently disable it. With this, Ikora's faith and resolve is restored and travels to the farm to meet with Zavala and Cayde. Back on Earth at the Farm, the reunited Vanguard discuss a strategy to disable the Almighty and liberate the City. Despite the impossibility of the task, they know it is worth it. Suraya Hawthorne helps the Vanguard in giving them directions to pass the Cities' walls undetected and advise the Guardian to take out Thumos, the Unbroken, take his security pass and ship to travel to the Almighty and disable it. On that cue, the Vanguard's forces will launch their attack and after getting close enough to the Traveler Suppressor Device, the Guardian would use the Vex teleporter to quickly travel to the device and free the Traveler. "Fitting your Traveler would send you to face me once more." After succeeding in taking down Thumos and stealing his personal ship, the Guardian travel to the Almighty to disable the massive weapon. Despite fighting past elite defenders and dealing with the intense solar rays, the Guardian succeeds in disabling the Almighty's coolants, causing it to malfunction, rendering it permanently inoperable. Escaping the massive warship, the Guardian informs the Vanguard of their success and head back to Earth to join the fight. On that cue, the Vanguard initiates their attack to liberate their home. Despite the loss of their light, the Vanguards forces succeed in breaking through the Red Legions defenses and set up the Vex device but are wounded in the process. 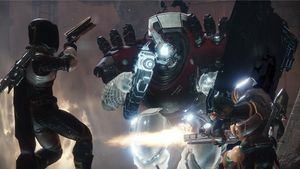 Despite this, the Guardian successfully uses the device and boards Ghaul's command ship, the Immortal, which is at the center of the Light-restraining device. Bypassing the ships forces, the Guardian reaches the top of the ship and encounter Ghaul once more. This time, however, Ghaul had forcibly taken a portion of the Traveler's Light to battle with the Guardian with abilities similar to theirs. Despite his power, Ghaul is killed by the Guardian but suddenly reincarnates as a massive ethereal being and speaks to the Traveler directly which awakens the ancient entity after centuries of slumber. Upon awakening, the Traveler shatters the device restraining it and destroys Ghaul once and for all. In addition, in a massive flash, the Light is restored to all Guardians and the Traveler fully awakens. With their powers restored, the Vanguard and Guardians are successful in driving the Red Legion out and reclaim their home. For the first time in all history, the Red Legion have been defeated and the entirety of the Cabal have been left leaderless and demoralized at the loss of their recently crowned Dominus. Despite the victory in reclaiming the Last City, there was still much work to do in dealing with what was left of the Red Legion while also handling other threats like the Fallen House of Dusk and the Vex while learning more about the new Hive breeds and containing the Taken. Such adventures lead the Guardians to disrupt Fallen raids, Cabal operations, Hive rituals and Vex efforts across the system while gathering supplies and intel from their enemies. The Guardians were able to also remove dangerous entities that would pose a threat to the system. .
On Nessus, the Red Legion had been drilling into The Inverted Spire, hoping to study and utilize Protheon, Modular Mind as weapon but the Vex responded violently, causing a warzone to break out near the drilling sites. The Vanguard learned of the legions efforts and sent in the Guardians to destroy Protheon before the Red Legion could capture the Vex Mind. After battling past Vex and Cabal forces, the Guardians descend into the Inverted Spire and face off against the Vex entity. Despite its firepower and altering the battlefield, the Guardians succeeded in destroying Protheon, depriving the Vex of an Axis Mind and the Cabal of a potential new weapon. On Io, the Vanguard pin-point the Vex's machine conversion of the moon at The Pyramidion, centered by Brakion, Genesis Mind. Not only do the Vanguard want to put a stop to the Vex's plans to turn Io into another machine world but also prevent any lingering Taken from corrupting the Genesis Mind into a powerful Taken entity. Storming the Pyramidion, the Guardians, guided by Asher Mir, evade Vex traps, Vex defenders and Taken enemies and enter a pit that leads to the Genesis Mind. Battling the Vex Mind, the Guardians succeed in destroying Brakion, hindering the Vex's efforts to convert Io and granting Asher Mir as sense of vengeance as it was Brakion who nearly converted him into a Vex machine. On Titan, the Guardians worked with Sloane in stabilizing the New Pacific Arcology's foundation to prevent it from sinking into the sea while also aiding in missions to power the ancient facilities and drive the Fallen and Hive off. During said missions, the Guardians discover multiple Hive rituals with the purpose of sinking the Arcology but were stopped by the Guardians at every turn. Sloane discovered a center point for these rituals deep beneath the Arcology and sent in fireteams to investigate. All went dark and none returned. Worried, Sloane sends in the Guardians to look for the lost teams and find out what the Hive are up to. Breaching Hive defenses, the Guardians discovered strange crystal emanating Void Light which they find strange as only Guardians can generate Void Light. Traveling further, the Guardians make radio contact with a Guardian named Taeko-3, the last surviving member of the previous fireteams, and learn that the Hive are forcibly extracting Void Light from Guardians to create the crystals to power a large Shrieker, Savathun's Song. Taeko-3 sacrifices her life to create a crystal the Guardians can use to access the Shrieker. They were successful in destroying Savathun's Song, avenging the fallen Guardians and preventing another Hive attempt to sink the New Pacific Arcology. Despite the demoralizing loss of their Dominus and the Consul, the Red Legion continued to be a threat to the Last City but the Guardians maintained their vigilance against them, primarily in the EDZ. Guardians succeeded in numerous efforts against the Red Legion, from sabotaging their defenses, supplies and vehicles, destroying any Mining Landers and Infiltrator bases encountered and taking out field commanders and high-profile leaders when found. In desperation, the Red Legion made contact with Bracus Zahn and his disgraced group to supply them with dangerous weapons needed to combat the Guardians. Hawthorne and Cayde intercepted their meeting with the Bracus and sent in the Guardians to take down Zahn. Breaching Firebase Hades, the Guardians hunted Zahn and his company throughout the Cabal Cruiser before cornering him at the airfields. Despite Zahn's weapons, the Guardians succeeded in taking down the Bracus, depriving the Red Legion of the much needed weapons. Thaviks, The Depraved at Exodus Black. 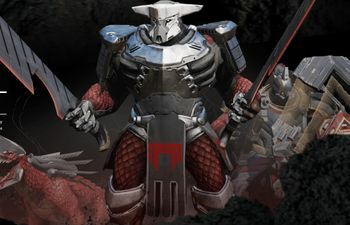 Though the Guardians and the Vanguard became aware of the newly emerged House of Dusk since the Red Legions arrival, they know very little about them, such as their goals, motives or even their leaders. Regardless, the Guardians battled the Fallen whenever and wherever they could, preventing them form stealing supplies for the Farm and City, taking out high-profile targets when encountered and thwarting Glimmer extraction crews. One major Fallen offense took place on Nessus, at the Exodus Black crash site, where the Fallen sought to tear apart the Golden Age vessel for anything of value. Failsafe called the Guardians for aid to protect itself. The Fallen breached the ships interior just as the Guardians arrived to help Failsafe. Battling the Fallen to the Aft end of the ship, the Guardians encounter the cloaked Thaviks, the Depraved. Despite his cloaking and overcharged shanks, Thaviks was killed and the Fallen were driven off as the Vanguard sent more teams to secure the crash site, saving Failsafe. Another Fallen plot was discovered in the EDZ where Guardians heard reports of "glowing Fallen". Investigating, the Guardians encountered the strange Fallen but discovered they are more enhanced versions of the Fallen than previously encountered. Further investigations into the plot discovered that the Fallen are using stolen Cabal technology to create enhanced ether to create stronger and more powerful soldiers. The Guardians scoured the Dead Zone and found numerous empty caches before finding the main supply cache, destroying it. Doing so, drew out the mastermind of the plot, Raksil, Archon Priest, the first Dusk Archon encountered. The Guardians battled with the Archon before cornering him in the Salt Mines and despite his enhanced defenders, Raksil was defeated. However, knowing that Raksil couldn't have created the enhanced ether without a Servitor, the Guardians used the Archons death to bring the servitor responsible for the production out of hiding. Their predictions proved true as Serkuleks, the Fount was forced into the open, allowing the Guardians to engage the Prime Servitor. Despite Serkulek's defenses and constant fleeing across the Dead Zone, the Guardians destroyed the Servitor, completely depriving the Dusk Fallen the means to produce more enhanced ether. In addition to Io, a remnant faction of Taken continued to operate within the European Dead Zone, primarily near the Dark Forest, battling whatever Fallen, Cabal or Guardian force that gets near. A contingent of the Red Legion began to use Psions to siphon Taken energy to empower themselves which causes the notice of the Vanguard. Fighting the Cabal through the Dark Forest in the Deadzone, the Guardians corner the Colossus in command of their activities and destroy him. A larger Taken force gathered in the Deadzone under the command of a Taken Phalanx, Grask, the Consumed. The Taken, under clear directions, were tasked to corrupt the natural landscape and water supply within the Deadzone using Taken energy. Should they succeed, then the entire Deadzone would be rendered inhospitable, threatening the Farm. After destroying each of the Taken's stronger forces and removing the Blight's causing the infestations, the Guardians were successful in defeating Grask, weakening the Taken in the Deadzone but the Vanguard continue to question who is creating new Taken and directing them in Oryx' absence. This lead the Vanguard to develop investigations into Oryx, specifically his sisters mentioned in the Books of Sorrow. Back on Io, Ikora Rey's Hidden agents discovered Vex units interacting with the Taken, causing her to worry if the Taken are preparing for something. She sends the Guardians to investigate and find that the Taken are kidnapping Vex units all over the region using Blights. Tracking down the Taken through a cave system to a abandoned Cabal base, the Guardians face off against Ir Arok, Tongue of Quria and other entities directing the Taken's efforts. The Guardians chase discovered that the Taken are preparing to build a new Taken army to replenish their ranks lost in the Taken War using the Vex. Though Ir Arok escapes again, the Guardians track the Taken Knight down to an area in the Pyramidion. Cornering the Knight, the Guardians succeed in defeating him but found that some of the Taken Vex traveled through a Blight portal, increasing the Taken's numbers but the Taken's efforts to build a new army have been temporarily stopped. Though the Guardians succeeded in killing the head of the Cabal, Dominus Ghaul's predecessor, Emperor Calus, returned to reclaim control of his empire. Traveling to the Solar System aboard his massive ship, The Leviathan, Calus immediately set to work on reclaiming the Cabal empire and gave elements of the now leaderless Red Legion the chance to "join the loyalist regime," sending them on missions to collect geological data on Nessus. These transmissions are intercepted in the Adventure Invitation from the Emperor. Calus intended to convert the soil of the planet into "Royal Wine". Calus was also aware of the Guardians and their efforts in slaying Ghaul. Offering them an audience with him, the Guardians travel to his palace on board The Leviathan and accept the exiled Emperor's challenge. Passing each of the challenges and defeating scores of Loyalist's forces, the Guardians face against Calus in his throne room. After a long battle, the Guardians damaged Calus but revealed a machine in the emperor's place. Regardless, the Guardians succeed in destroying the duplicate and before its destruction, Calus boasts about his power, offering them a place at his side and knowledge of the "real truth" about the universe and the purpose of the Traveler. At some point months later, the Leviathan consumed a chunk of Nessus that contained a powerful Vex Mind, Argos, Planetary Core, the entity responsible for converting Nessus into a machine world, which then caused the world-eater to clog up and malfunction. Emperor Calus immediately called upon the aid of the Guardians to destroy the Vex intrusion, where they succeeded and repaired the Leviathan. However, as they destroyed the Axis Mind, the barrier protecting itself was removed, thereby threatening the Guardians to be consumed by the fiery inferno of the Leviathan. Calus then saved the Guardians from being sucked into the Leviathan afterward, where he rewarded and congratulated them for their efforts. Unbeknownst to Guardians and the other inhabitants of the Solar System, at the moment of the Traveler's reawakening, that pulse of Light continued spreading well beyond Earth. Eventually, it passed through extragalactic space beyond the bounds of the Milky Way, rousing an unknown alien fleet from dormancy. The fleet turned towards the source of the Light and presumably began traveling toward the Solar System. In addition, the pulse also reopened the gate to the Infinite Forest in Mercury. The Vex then began to unite on Mercury after the gate reopened, forcing the former Vanguard Osiris to emerge from exile to prevent the Vex from merging with time itself. With the exiled Warlock and the Guardians working together, they manged to destroy the powerful Axis Mind, Panoptes, Infinite Mind, sending the Vex into disarray. After the plot with the Vex had been thwarted, another threat arose in the frozen tundra of Hellas Basin on Mars, the mysterious Hive faction, the Grasp of Nokris. 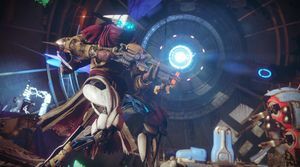 Led by the Worm God, Xol, and his herald Nokris, the Hive sought to destroy the core of the Warmind Rasputin, leading the Guardians to team up with renegade Hunter, Ana Bray and eventually forge a shaky alliance with Rasputin. The Red Legion Invades the Leviathan. "Light-borne, your return to my Leviathan is most timely. I have guests who are... misbehaving." Following the events of the Red War, Val Ca'uor established himself as the new leader of the Red Legion, where he ordered a massive assault upon the Leviathan. The acting Dominus aimed to assume control over the massive space craft for the Red Legion's purposes, likely to rebuild their power and strength following the loss of Ghaul and so many other crippling losses at the hands of the Guardians. Thus, Val Ca'uor led a large Red Legion fleet to pry the Leviathan from the former Cabal Emperor. Following Val Ca'uor's invasion, Emperor Calus ordered a Guardian response team to repel the Red Legion, offering further riches and rewards upon their success. The Guardians heeded the exiled emperor's call and ascended the Leviathan's spire, just as the acting Dominus destroyed one of Calus's robotic proxies. Upon confronting Ca'uor, the Guardians engaged the Red Legion's elite forces to prevent them from taking control of the Leviathan. 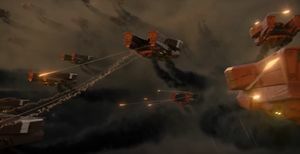 Using the Leviathan's own formidable weapons, the Guardians managed to decimate the Red Legion fleet blockading the Spire and killed the acting Dominus in a climatic battle. In the wake of losing the majority of their fleet, their ground forces and leader, the Red Legion was forced to withdrawal in disgrace. Ca'uor's death would officially mark the effective end of the Red War.